Download a from The Intentional Mama. 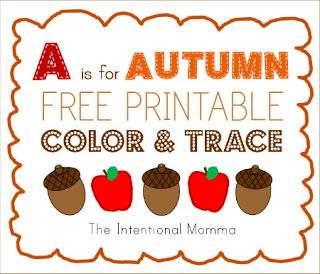 The features an Autumn theme, focusing on the letter A. Apples, Ants, and Acorns are incorporated. Ages 3-5 will love tracing, counting, matching, and coloring in this super simple preschool printable! I had to sign up for a free account at teacherspayteachers.com (the site where the download is hosted) in order to get it. You might want to add that to your post as an FYI.